Chart of the week: Playable ads poised for growth Getting any app promoted and downloaded by users is an increasingly difficult game. That's why interactive or playable ads have grabbed the attention and imagination of many app developers. 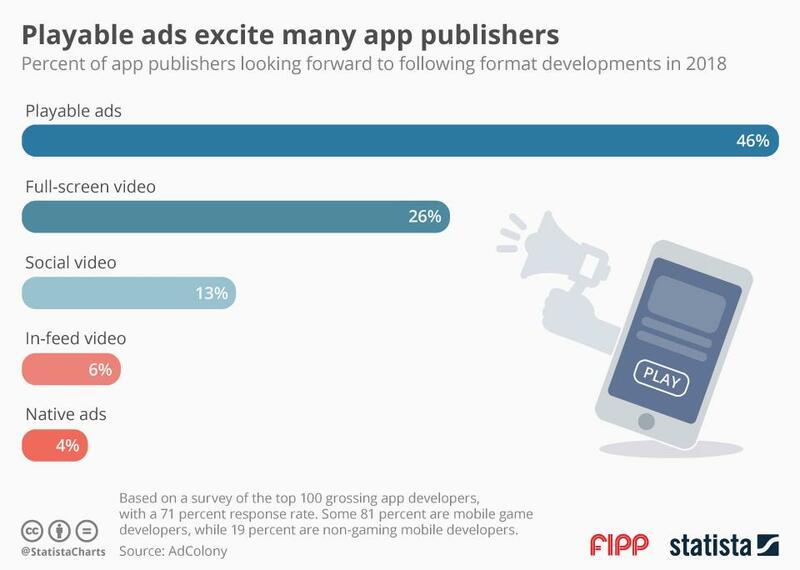 According to a survey by AdColony, 46 per cent of leading app developers they asked (of which many are in the gaming industry) said this format has their full attention in the year ahead. This is double the share playable ads got last year (25 per cent). Playable ads are a form of so-called app-install ads, which have become an increasingly important way of promoting apps. They are mini games in banner format which can be played by users and give them the opportunity to "test drive" a mobile game before downloading the proper app. Letting users have a taste before committing to the app ensures that the churn rate will stay low and more users will stick with it for longer. Also, all moving pic formats are held in high esteem by the app marketers - from full screen video (26 per cent) to social video (13 per cent) and in-feed video (six per cent).